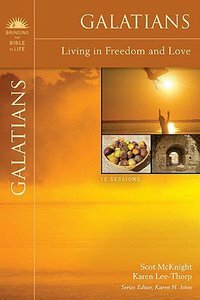 About "Galatians (Bringing The Bible To Life Series)"
Scot McKnight (Ph.D., University of Nottingham) is the Karl A. Olsson Professor in Religious Studies at North Park University. Prior to joining the NPU faculty in 1994, he was a professor at Trinity Evangelical Divinity School. He has written widely on the historical Jesus, Christian spirituality, and the Emerging Church. One of McKnight's more popular books, The Jesus Creed, won the Christianity Today's book award for 2004 in the area of Christian living. McKnight's blog, JesusCreed.org, has been a popular site for Emerging Church discussion. His other publications include: The Real Mary: Why Evangelical Christians Can Embrace the Mother of Jesus; Praying with the Church: Following Jesus Daily, Hourly, Today; Jesus and His Death: Historiography, the Historical Jesus, and Atonement Theory; Embracing Grace: A Gospel for All of Us; Turning to Jesus: The Sociology of Conversion in the Gospels; The Story of the Christ, with Philip Law; and 1 Peter and Galatians in NIV Application Commentary. His most recent publications include The Blue Parakeet: Rethinking How You Read the Bible and James (New International Commentary on the New Testament). Order now to secure your copy when our stock arrives. Other edition is available. 0310494109 0 Available. Expected to ship in 6 to 7 weeks from Australia.